Despite mediocre ratings, FOX renewed Touch for a second season. Will the TV series’ luck hold out long enough for it to be renewed for a third season — or will it be cancelled instead? We’ll have to wait, watch the ratings, and see. The second season of Touch typically airs Friday nights on the FOX network. They’ve ordered 13 episodes and the show’s cast includes Kiefer Sutherland, David Mazouz, Gugu Mbatha-Raw, Lukas Haas, Maria Bello, Said Taghmaoui, and Saxon Sharbino. Below are the TV show’s ratings for the 2012-13 season, the best way to tell if Touch is going to be cancelled or renewed for a third season. Final series averages: 0.7 rating in the 18-49 demographic with 2.66 million total viewers. 0.6 in the demo (0% change) with 2.42 million (+11% change). Season averages: 0.70 in the demo with 2.66 million. UPDATE: Touch has been cancelled after two seasons. 0.6 in the demo (0% change) with 2.19 million (-1% change). Season averages: 0.71 in the demo with 2.68 million. 0.6 in the demo (0% change) with 2.22 million (-3% change). Season averages: 0.72 in the demo with 2.73 million. 0.6 in the demo (+20% change) with 2.29 million (-3% change). Season averages: 0.73 in the demo with 2.78 million. 0.5 in the demo (-29% change) with 2.37 million (-15% change). Season averages: 0.74 in the demo with 2.83 million. 0.7 in the demo (+17% change) with 2.79 million (+26% change). Season averages: 0.78 in the demo with 2.89 million. 0.6 in the demo (-14% change) with 2.22 million (-15% change). Season averages: 0.79 in the demo with 2.90 million. 0.7 in the demo (-13% change) with 2.60 million (-10% change). Season averages: 0.82 in the demo with 3.02 million. 0.8 in the demo (+14% change) with 2.90 million (+16% change). Season averages: 0.84 in the demo with 3.10 million. 0.7 in the demo (0% change) with 2.51 million (-2% change). Season averages: 0.85 in the demo with 3.15 million. 0.7 in the demo (-22% change) with 2.56 million (-29% change). Season averages: 0.90 in the demo with 3.36 million. 0.9 in the demo (-18% change) with 3.59 million (-9% change). Season averages: 1.00 in the demo with 3.76 million. 1.1 rating in the 18-49 demographic with 3.94 million total viewers. Season averages: 1.10 in the demo with 3.94 million. Compared to the TV series’ debut a year ago, the season premiere was way down in the ratings — by 72% in the demo (vs a 3.9 rating) and by 67% in viewership (vs 12.01 million). Not good — even for a Friday night show. 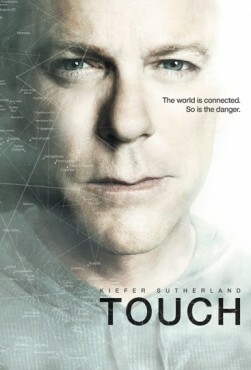 Reference point: The 2011-12 season of Touch averaged a 2.1 rating in the 18-49 demographic and 7.2 million viewers. What do you think? Do you still like the Touch TV series? Do you think it should be cancelled or renewed for a third season? I also love this show, because its unique and makes us think outside the box. Its hard to believe with all these positive comments that the ratings were doing so poorly. Maybe not many people even knew about the show to begin with. Enjoyed watching this show. It is getting so I don’t want to get attached to any new series, cuz they just cancel it anyway! !